1. Preheat the oven to 200˚C, gas mark 6. Toss the potatoes, lemon slices and oregano with 2 tbsp olive oil. Season, spread out on a roasting tin (tuck the lemon slices under pieces of potato to prevent them from catching) and roast for 50 minutes, turning halfway, until golden and soft. 2. Put the kalettes, 3 tbsp olive oil and the garlic in a large casserole dish or deep-sided frying pan, tossing through to combine. Set over a medium-high heat and stir-fry until the kalettes begin to sizzle. Add 2 tbsp water, cover with a lid and turn the heat to low. Cook for 5 minutes, stirring occasionally, until the kalettes are soft and no liquid remains. Toss through the lemon juice and season. 3. Heat the remaining 1 tbsp oil in a frying pan and fry the eggs until cooked to your liking. 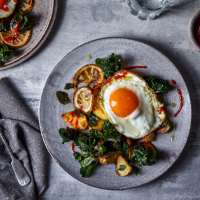 Divide the potatoes and kalettes between 4 plates and top each with a fried egg, adding a drizzle of extra virgin olive oil and a little chilli sauce, if liked.